1. Definition of Top Down Process. b. Top-Down processing strategy is activating prior knowledge to make prediction about the text top-down processing is pre-listening activity which emphasizes to how activate the students prior knowledge. 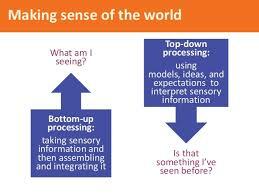 Belum ada tanggapan untuk "The Concepts of Top Down and Bottom up processing"